Unprecedented debt levels, slowing demographic trends in spending, and deflation in prices (not inflation) will create a crisis much like the early 1930s. These are the three Ds—debt, demographics, and deflation—that people must understand in these increasingly volatile times to survive and prosper. The massive stimulus program will fail by late summer and create a greater banking crisis than we saw in late 2008. Individuals and businesses that see this coming can prepare to prosper as the greatest sale on financial assets since the early 1930s creates unprecedented opportunities “out of the ashes.” This crisis will paradoxically reduce our debt levels and cost of living, generating another mass prosperity boom as followed the Great Depression. Harry Dent gives shorter term and longer term strategies for preparing and prospering in the debt crisis just ahead and the longer winter season into 2020/2023. Even the bearish forecasters like Peter Schiff will be wrong about major trends they are predicting, like a falling US dollar and rising gold prices. Individual investors will understand how to manage their stock portfolios, real estate investments, and cash accounts. This program is like a self-paced economics course for your money that you can enjoy while you commute or workout. Business owners and investors will have a clear directive on how to thrive through a downturn. 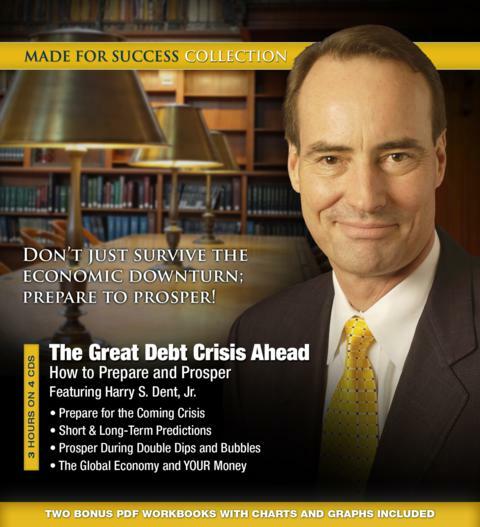 Tags: crisis, debt, deflation, finance, Harry S. Dent, investing, Jr. Copyright 2014 Made For Success. All Rights Reserved.